To be properly prepared with food storage you have to have different types of food and different methods of storing it. This is important because you have different food needs. In my last post in this series (FOOD: Part 1 – Introduction) I covered the basic information to introduce you to food storage. I touched on the most important aspect of food storage…chocolate! OK, maybe not the very most important aspect, but don’t forget to store some goodies for your family’s sweet-tooth. To succeed in this preparedness effort you need to have multiple layers of food storage to keep hunger as far from you and your family as possible. Each layer defends against a specific food shortage crisis or need. What types of food shortage crisis are there? Wow! Pretty wide selection of possible crisis issues to consider. Why so many? Because food is so critical to sustaining life there are plenty of potential problem areas. Any one of those areas can create anything from minor financial issues to potential starvation. One of the best things about food storage, the one thing that will never fail you…you can always eat it. The other major benefit to food storage…I have never seen my food storage items go down in value. “Layering” is looking at a challenge, in this case hunger, and making sure you have multiple realistic ways to deal with it. Look at it as a way to mitigate the severity of a problem. Example: You might not be able to prevent or reduce the probability of a trucker strike can you? But having food storage allows you to not go hungry. Thus, you mitigated the severity of the impact by having food in your house that you and your family can eat, avoiding starvation. The concept is to have multiple methods (i.e. layers) to deal with events in your life that present hunger as a risk. 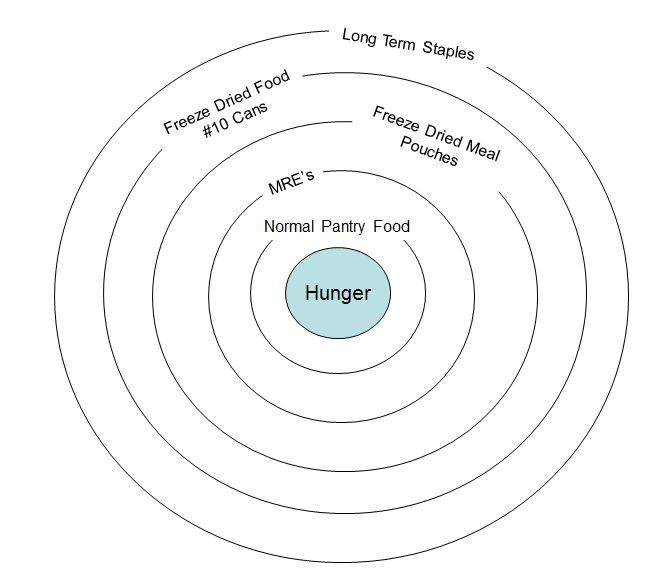 Example: Your normal pantry food supply covers your daily hunger needs through the preparation of regular meals. But should a longer term risk occur (i.e. unemployment), your pantry food and freeze dried food in #10 cans can also help keep the hunger away without going to the store. Should you find yourself retired then you can throw in longer term staple food items as well to keep food on the table and cash in your pocket. 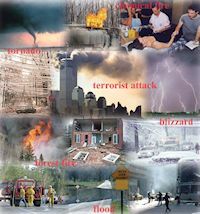 Obviously should an emergency or disaster come along such as hurricane or trucker’s strike, then all levels of food storage can combine to feed your family. If that disaster would include a power outage you still have MRE’s that don’t require any outside heating source. And should “grid-down” hit your world then you have a year or more worth of food to feed your family while you plant your heirloom seeds and grow a garden. Oh, you do have heirloom seeds, yes? 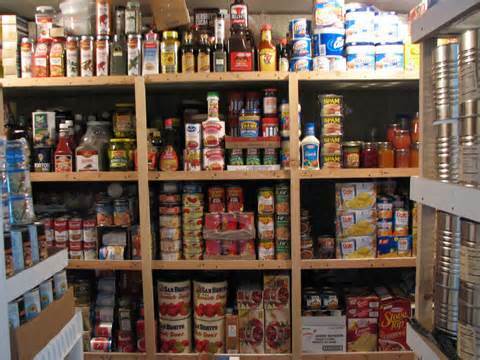 Normal pantry food – This is the food that you eat on a normal everyday basis. MRE’s – These a military grade Meals-Ready-To-Eat with heaters. Freeze dried meal pouches – These are different main dishes (i.e. lasagna) that have been freeze dried and then packaged in commercial grade packaging. Stays edible for 10 – 25 years. Freeze dried food in #10 cans – These are different main dishes (i.e. lasagna) that have been freeze dried and then packaged in commercial grade #10 cans. Stays edible for 15 – 25 years. Long-term staples – These are the basics to sustain life; wheat, rice, oats, beans, etc. The item is then packaged in commercial grade #10 cans. Stays edible for 20 – 30 years. Notice that I have not included home canned items in this list. The reason is my opinion of stability and transportability. Since 99.9% of all canning is done in glass jars I think they are not suitable to be considered as anything other than normal pantry food, I do not consider them in any other category. Now, don’t get me wrong, I have no problem with you having 1 – 2 years’ worth of normal pantry food. As I look at all those glass jars though I see a big problem trying to transport them anywhere and have them remain intact. Also, I seem them as less than desirable for rough condition of any kind in a “grid-down” scenario; they are “glass” and heave and easily broken. But I love home canned fruits and they have a place in the food storage plan. I believe it is under the “normal pantry food” category.